All-inclusive implementation, 24/7 support and unlimited training. Pros: Megamation has been able to customize DirectLine for our situation. 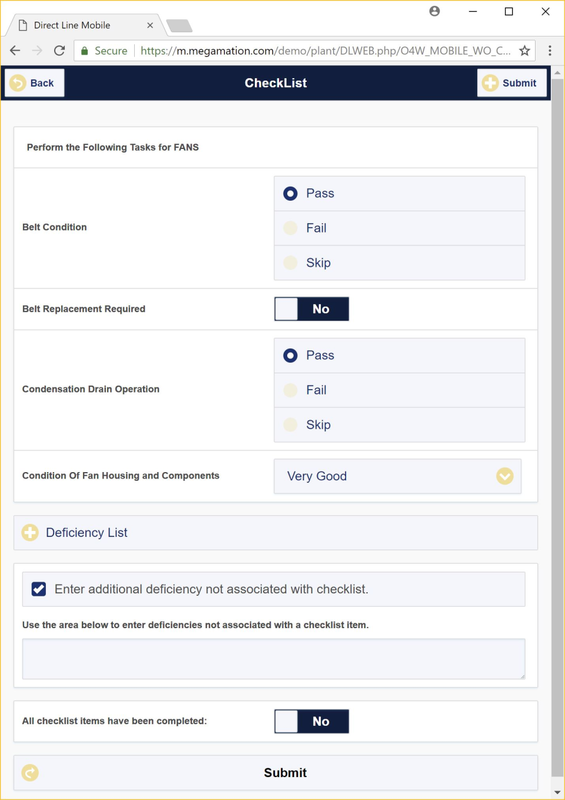 We've been able to set up On-Demand inspections that will create a work order if a deficiency is found. Great for dorm room and mechanical equipment inspections. Their Mobile app that allows maintenance workers access to their work orders from a smart device (Kindle or phone). The adoption of mobile work request system eliminates the printed copies, allows for receipt of work requests in the field, and improves staff productivity by refocusing time spent on paperwork to time spent in the field. Cons: Because the software is customize-able, it took us a while to understand our real needs and how we could make the software work best for us. It was very helpful when Megamation put us in contact with a retired College Facilities person that understood the DirectLine system and the needs of a college system. Pros: Program is very simple the learn and use. I have setup new plants / users in as little as 3 months time. Most users report the program being simple to use with a short learning curve. Cons: As a large user the cost approaches that of a purchased system especially when looking at the cost over several years. Overall: The program is very good for smaller users or users with few locations. As long as the program is setup correctly it is easy to use and users can work with it right away. We have been successfully using it for four years now and have increased the number of users each year. Comments: We've been actively using Megamation for all of our facilities since 2010 and haven't looked back since. I recommend Megamation without reservation; try it. Pros: This is a powerful, full featured, world-class, CMMS system quite able to handle all that you can throw at it. Support is outstanding. Where they really shine is; As our business needs change, they listen and respond accordingly. This isn't something you find elsewhere. It has features we haven't yet even used, but plan to as we grow. Cons: Not much not to like. Online documentation is at times, vague or not current. But, all you need to do is give them a call to clear something up. Pros: I can't say enough about the Technical Support Team. They are very knowledgeable, polite and always willing to help. I also like that it is a lease product. To keep a good customer base requires satisfied customers. Good concept! Cons: Occasionally we need to have a special request done by a programmer, but, there again, this company make it as smooth as possible. Overall: Megamation DirectLine has been easy to pick up and run with. On the rare occasion that I need help the Customer Service Tech team has never failed to have me back up and running in a very short time frame. Recommendations to other buyers: Take a good look at this product. We have looked and many and used another. Megamation DirectLine is working very well for us. Pros: I like that it is a program for creating work orders and not a different program that has this feature added to it. 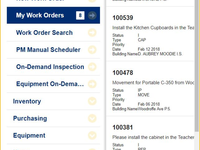 I like the work order console concept and how it presents your WOs to you, arranged how you like it. I like having multiple windows open while I am working on different things. The team behind this program is very very helpful. They are always willing to help and teach, regardless of the issues. This is the best part of the program. Cons: I am the go-to guy in the shop for this stuff. I am learning it as I go with the help of the support team. When I first started to use the program as a user it fount it was a little clumsy. Not being able to "double click" on the description of the work order to open it. Having to close the "View work order" screen and open and "Close work order" screen to close it when the work order was done. Opening multiple windows and navigating through them was not something that came easily, but now that I know its obvious. This program is great and can do lots but for the person who turns the wrench it can be a little too much for what they need it to be, for now. Cons: Photo inclusion is a bit clunky and difficult to utilize smoothly, cost per module is initially a selling point but as the system is setup it would be better to have all modules available. Cons: I have no complaints, we only use a small portion of Megamation's capabilities, I'd like the font to be larger. Other than that I am a very happy user. Overall: tracking work orders, tracking equipment repairs, prompts for Preventative Maintenance, daily, weekly , monthly. Cons: I have no complaints, most maintenance organization only use 30% of there CMMS. Overall: Highly recommend, Great tool, user friendly, great tech support always will to change and modify application to meet our needs. I use this tool everyday for maintenance work flow management, inventory tracking and purchasing. I have worked industrial maintenance for 25 years and by far this is the best CMMS tool I have used. Pros: The software is suited to best fit the needs of my company. As we grow this software grows with it. When we first started the set up it was with a second facility in mind. Cons: The only thing that needs improvement is the reporting. Its very general. 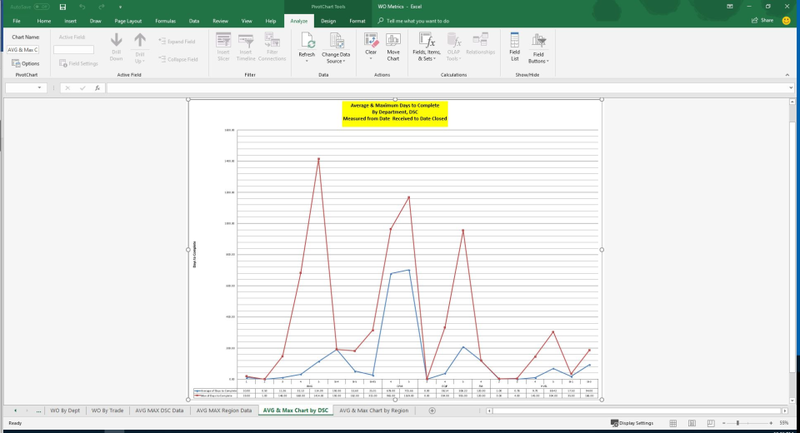 It is easy but I'd like to have my weekly reporting export directly into a chart set up. Maybe better training. Overall: Organization, history, tracking.....list is long. Cons: The software (administrative portion) is not the easiest to use and the reporting is a bit clunky. 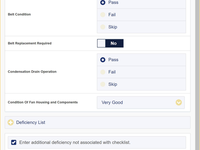 In terms of ease of use - this application has extensive functionality and, in my experience, it is difficult to make such applications "completely" friendly to users who don't have a level of experience working with CMMS systems, so I don't consider this a drawback. Pros: User friendly, great support. Cons: Nothing we dislike at this time. Overall: We are thrilled with DirectLine so far. 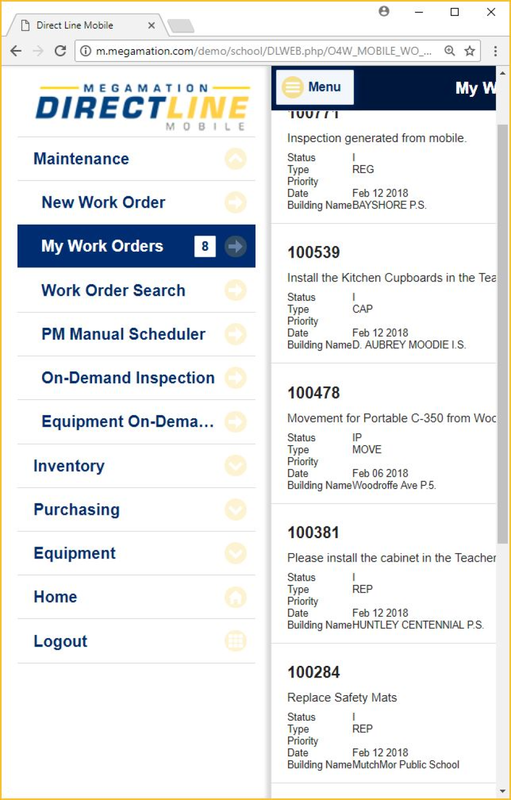 The system is very user friendly and as we trained all our managers, supervisors and group leaders, we haven't missed a beat in creating work orders. 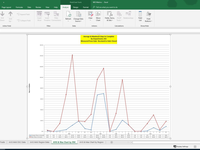 We have also started up PM programs in several departments (with all documents needed scanned into the system) and we are now working on generating reports. The support from your team has been tremendous. All changes we have requested has been granted and every question we have had, has been answered. We are eagerly looking forward to what the future is bringing. Comments: Shopped around for a CMMS application for almost a year, we consider this a solid platform for our maintenance programs. Pros: Help is always available, affordable alternative to an expensive software suite. Screens are easy to navigate. Cons: There was a bit of a learning curve for some staff who did not use the system on a frequent basis, but support was available. Pros: The software works well and predictably. I appreciate the support I have received from DirectLine. Having 24 hour support is fantastic. The support Staff is always helpful and they are quick to fix my issues. Cons: Too many mouse clicks for a scheduler/superuser. I think they could do a better job making some of the redundant tasks more streamlined. Overall: I have a very good idea of what maintenance activities are being done in my group. It's straight forward to schedule the maintenance. Pros: This is my second launch of MegaMation in a facilities application. The previous instance was in a hospital setting and it went smoothly as well. Both applications were customized to meet my specific needs and this is an evolving process; not just an initial start-up service. Often they have had a better idea about how to meet my specific requests, sometimes in ways I hadn't even considered, and other times we've both had to go back to the drawing board. The outcome is always consistent though, we always get what we need. Cons: In both places that I have used MegaMation, it is hard for the IT people and Privacy people to wrap their heads around the concept of off-site servers and not "buying" the software. The best analogy one can use is that we all use on-line banking with our personal information out there in an off-site server and we don't own the software. Overall: Over the past 5 years I would estimate that I have recommended MegaMation to 50 organizations. The highest recommendation that I can reference is that the use of MegaMation was a condition of my accepting the position that I am in now. Pros: We use the software for work orders, equipment lists, repairs, and tracking, the software has tons of applications to choose from and the support from the staff is exceptional. Fantastically versatile, exceptional customer service and support for even the smallest issues. Pros: Effectively made this a one stop shop to provide a tool kit to maintenance and engineering, for any industrial environment. It is also configurable to our needs. Cons: Can be a little overwhelming at first until your organization understands it's abilities and how you want to use them. Overall: Allows us the benefits of keeping up to date on all things maintenance, allowing improved equipment availability. Pros: Customers now have a single path to get their needs met. This has allowed us to properly organize our time. Cons: Some of the modules in the product are unnecessary for us. Recommendations to other buyers: Be sure the vendor is assessable by all your staff. Is there a number any staff member can call for tech support? Can tech support take care of the problem while your staff is on the phone with them?? Great system, lots of options. Pros: Great system, lot of options. Good customer support. I am using characters to fill up this minimum requirement. Cons: Some delays and difficulty in setting up custom features. Some technicians are too technical in their communications. Pros: It helped us move from papers to paperless, easy to look up information if you know what you're looking for. Costumer service is excellent! Cons: It's slow, but that maybe our internet. You have to switch between several screen to get all the information you need sometime. 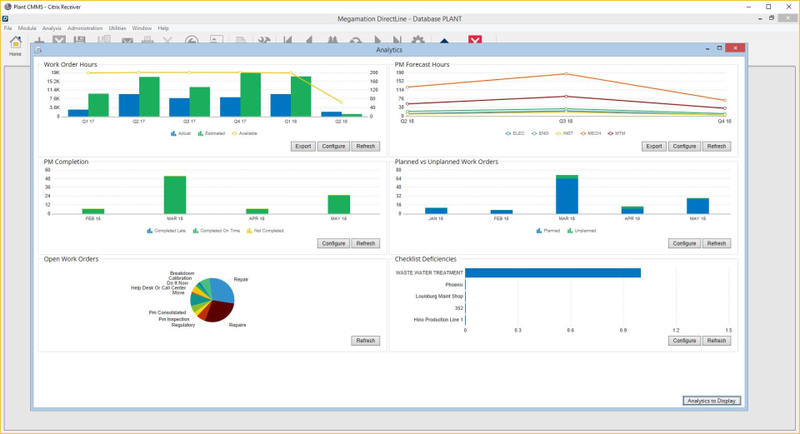 Pros: Having MegaMation Directline is like a custom built system tailored for your specific needs at an off the shelf price. We are the APPA 2011 Effective and Innovative Practices Award winner. 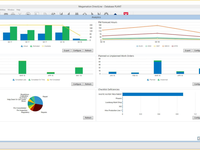 MegaMAtion Directline was a vital part of our lean enterprise processes in facilities management. Cons: There is nothing I dislike. They have a wonderful staff and a great product. Recommendations to other buyers: Keep in mind that your needs will change, and MegaMation Directline does not charge additional fees for adding/using modules you have not used in the past. 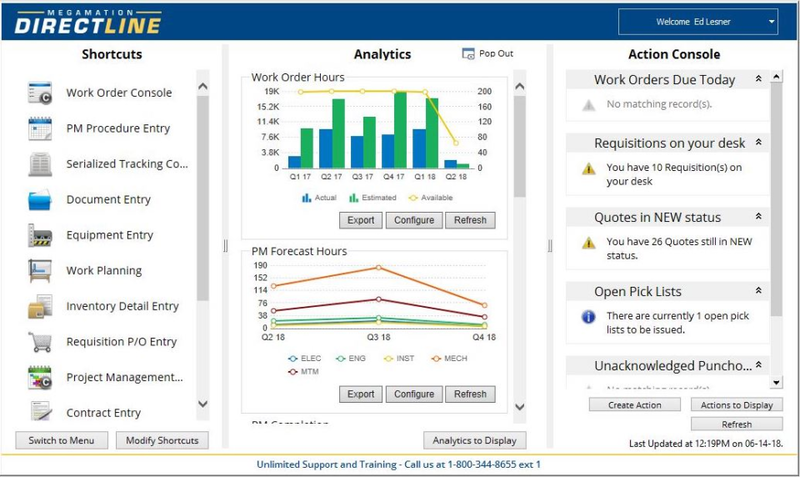 As you begin to use a good computerized maintenance management system (CMMS), you will realize other ways in which the system can be utilized to increase efficiency and monitor the workforce productivity . Other companies charge additional fees for using additional modules, or they charge you for research and development to create customization. Directline does this for free. Compare what you would pay for all the modules with another vendor as you may end up paying for them as your needs change. Do not get fooled by lesser CMMS companies telling you you'll never need more than they offer. Pros: Very professional CMMS with excellent support. Gives up great method to track, schedule and document preventative maintenance. Cons: Somewhat awkward to navigate until trained and get some experience with it. Recommendations to other buyers: Carefully think through equipment naming and organization of parent/child relationships. Support for program is fantastic! Comments: Support team has seemed genuinely happy to help me anytime I ask. They are quick and efficient in their support and come up with great ways to use the system to help me! Cons: It is a good software on overall but there is many glitches, most due to improper use and lack of training. More webinars on you tube should be available. Comments: Overall nice to work with. Pros: The system modules are very easy to identify and operate. Very comprehensive list of functions. Customer service has been excellent. Cons: Unable view picture of equipment along with the equipment information. No print function for PM's unless the WO is scheduled. Comments: After viewing a demo of the direct line software I found it to be full of potential. I truly enjoy having that amount of freedom to do with the program as I choose. Pros: This is a cloud based product, so no need to load your servers. Cons: The cost for some is a bit pricey. Comments: Customer Support is Great, but the program is difficult to learn and there are no " EASY" text instructions to help you. Pros: The program works well when you learn it. Recommendations to other buyers: Use Customer Support to help you learn the program. Pros: This program is very easy to use, the reports are great and fast. The support is always there and if a question can not be answered at the time an answer will come in a very short time frame. When i help people start up the program it does not take a lot of time for them to be using a module. Cons: There could be more web based items avalible to the system. Overall: Keep up the good work!!! Comments: Since our implementation of DirectLine, Megamation has completed may customizations to meet our needs. These have help us to satisfy regulatory requirements, improve our business management and gain acceptance from users. Cons: For us it took a while to comprehend our genuine needs and how we could influence the product to work best for us. 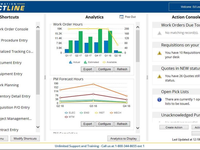 Pros: Excellent maintenance software programs. Cons: I have nothing negative to say about system. Pros: They have a great search engine for all modules.